The discount accommodation provided by the Snooze Inn Hotel in Brisbane is ideally positioned close to some of Brisbane's famous landmarks including, the RNA Exhibtion Showgrounds, Chinatown, the Tivoli, Royal Brisbane Hospitial and Suncorp Stadium. This budget hotel is situated right in the heart of Brisbane's most happening and cosmopolitan suburb, Fortitude Valley, only a few minutes walk from the train station and some of the best bars, clubs, and nightlife of Brisbane. The Snooze Inn Hotel Brisbane is perfect for long or short business stays and vacations to Brisbane. With easy access to all of the major businesses and tourist attractions in Brisbane the Snooze Inn is the ideal place for your next stay in Brisbane. This property also features numerous guest services and facilites including direct internet access, faxing facilities, guest laundry, luggage storagem baby cots available for families and daily housekeeping. 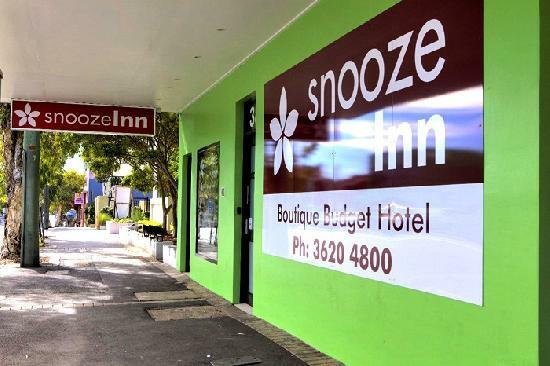 The Snooze Inn prides itself of providing clean and comfortable Brisbane hotel accommodation that is perfect for the budget conscious traveller. 1 Double & 1 Single Hotel Room : Sleeps up to 3 guests on 1 Double Bed & 1 Single Bed.